-The “Dovetail” name comes from the “dovetail joint”. The dovetail joint is used to join the sides of a drawer to the front, so the idea is that it joins things together. Basically, they want to bring together different cuisines and cooking styles! (Tad’s Note: Unfortunately, I have no idea how to build a drawer. But apparently the restaurant was named after it). -We’ve been here a couple of times, but this is the first time that we bothered to actually take pictures. -The others may have only been here a couple of times, but I’ve been here many more times. I’m just here to see these guys refine themselves. What a Pygmalion am I. 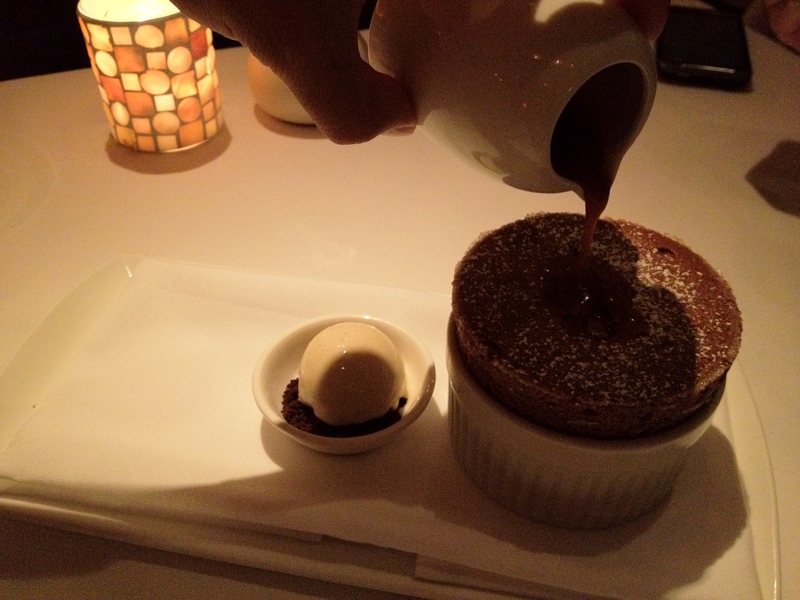 -This is one of my favorite restaurants because it’s really casual and close. It’s one of the few restaurants worth going to in the Upper West Side, and their dress code is just smart casual (that means jeans allowed for you Plebes). -Despite the chef’s pedigree, it is actually surprisingly easy to get reservations here… It makes it feel less exclusive :(. 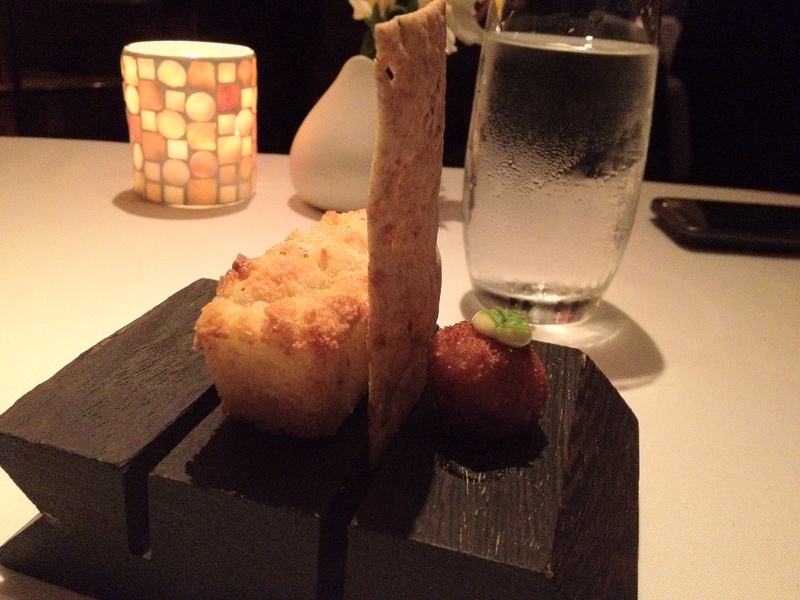 DELICIOUS cornbread, rosemary cracker, and truffle arancini. Monte: The Arancini is so juicy and bursts in your mouth with a pleasantly overwhelming aroma of truffle. It’s soft, crispy, and delicate – yet the flavor remains well after you’ve finished the small bite. Tad: I don’t like how they only use a tiny bit of truffle. What is this, McDonald’s? Anyway, people think bread is a simple course, but at good restaurants, they put a lot of effort into it. Just adding butter is not the way to win Tad’s custom. 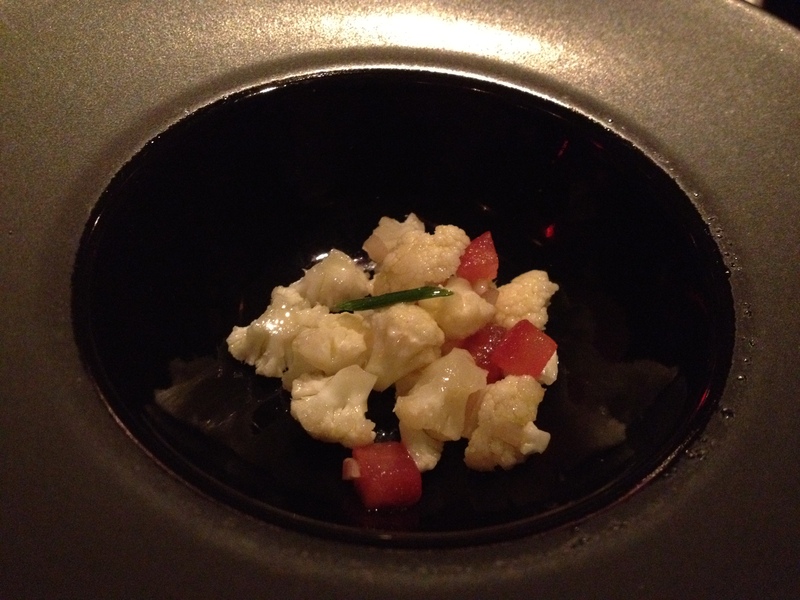 Cauliflower and marinated heirloom tomatoes with fresh chives. Monte: It was light, fresh, clean. The tomatos lent a really tart yet sweet undertone to the dish. A good start to the meal. 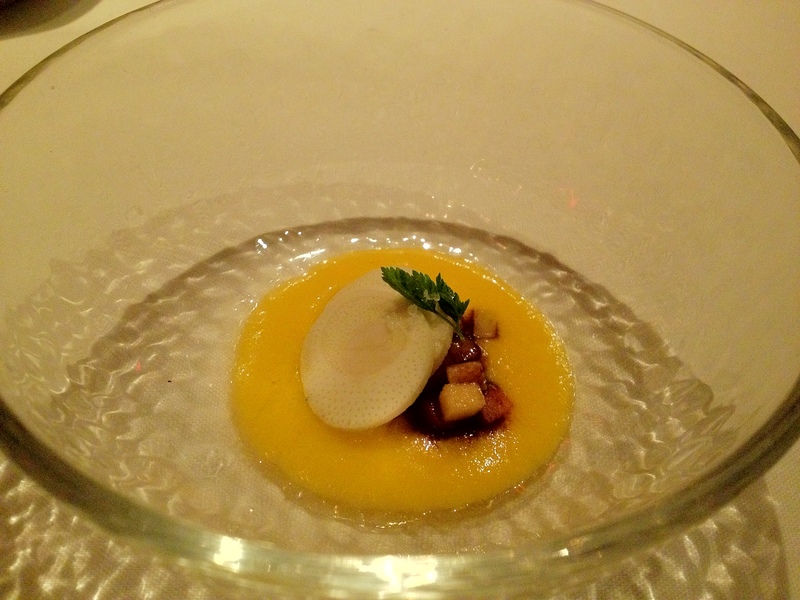 Tad: Well, my bouche was amused. 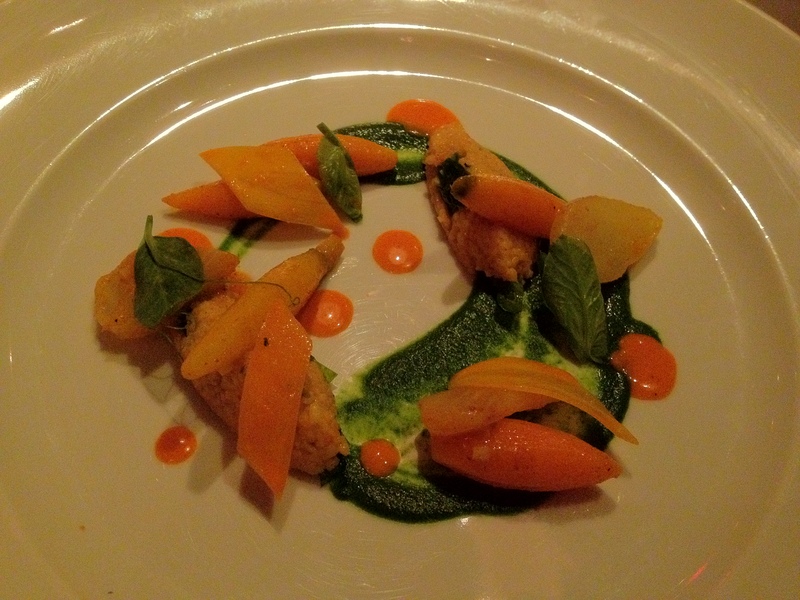 To truly enjoy the culinary prowess of a chef, you have to try a vegetable tasting menu. Any fool with a smock can make lobster and caviar taste good (these fools tried it with the caviar I got them), but it takes a true master to make peasant food like cauliflower or beets pass the grade. Cantaloupe soup with pickled watermelon, fennel, and marinated hearts of palm. 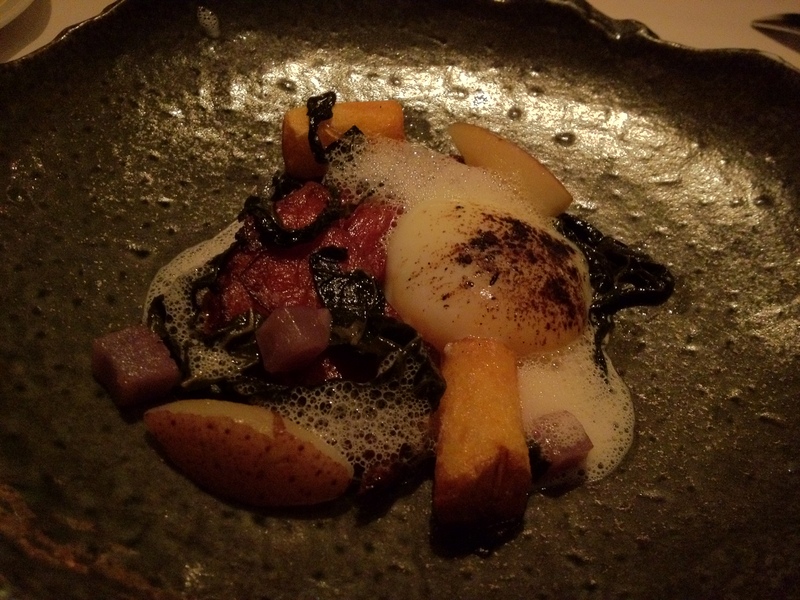 Monte: I love hearts of palm in this dish – it was meaty, with only a hint of tartness and overall was a nice contrast to the sweet cantaloupe. Tad: This was pretty good. The watermelon tasted quite strong. I suppose this is what some people say “summer” tastes like, although my parents didn’t really feed me watermelon by itself. Or, if they did, it was premium seedless, and my nanny had to slice it for me or juice it. Anyway, this tasted like summer. Victor: This was so good! I also LOVED watermelon growing up. My mom prepared it for me a lot when I was young! Tad: Ew. Your mom actually… prepared food herself? Monte: The turnip was meaty and the habanero spice really cut well through sweet/sour tones of the other flavors. 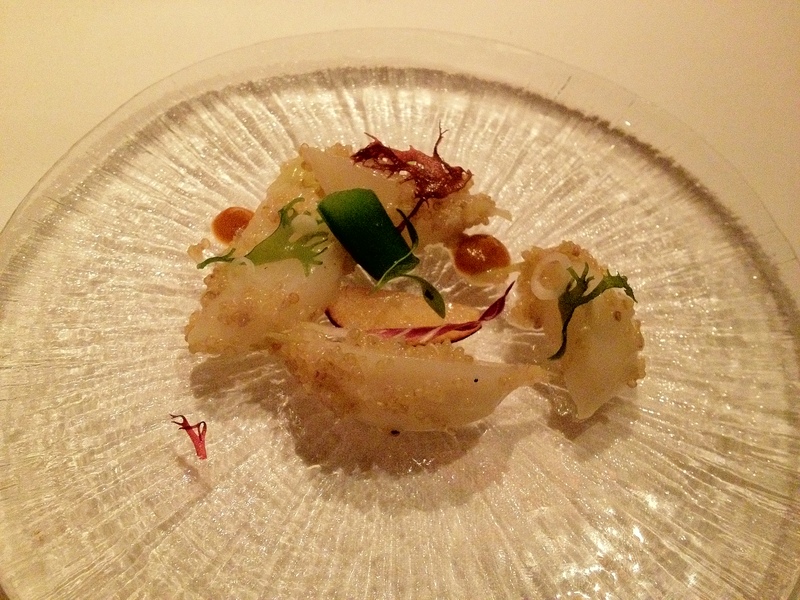 It felt like I was eating a ceviche made with seafood – everything was really well marinated. Tad: This reminds me of the time when a waiter at Jean Georges referred to their crudo dish as a “sushi dish.” Sushi means vinegar rice, as even a gaijin like me knows. 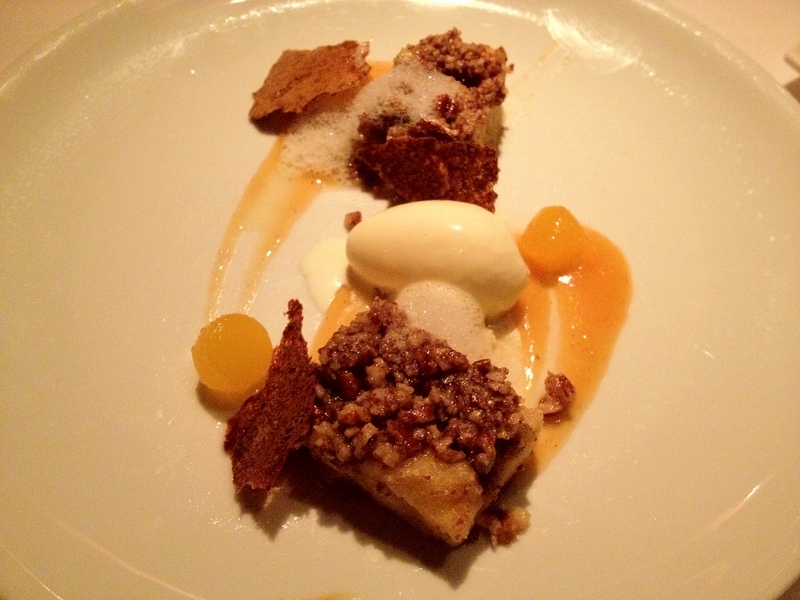 If you are going to work at Jean Georges, you should know that about food. At most, I would understand it if it were referred to as a sashimi dish, which is simply raw fish. 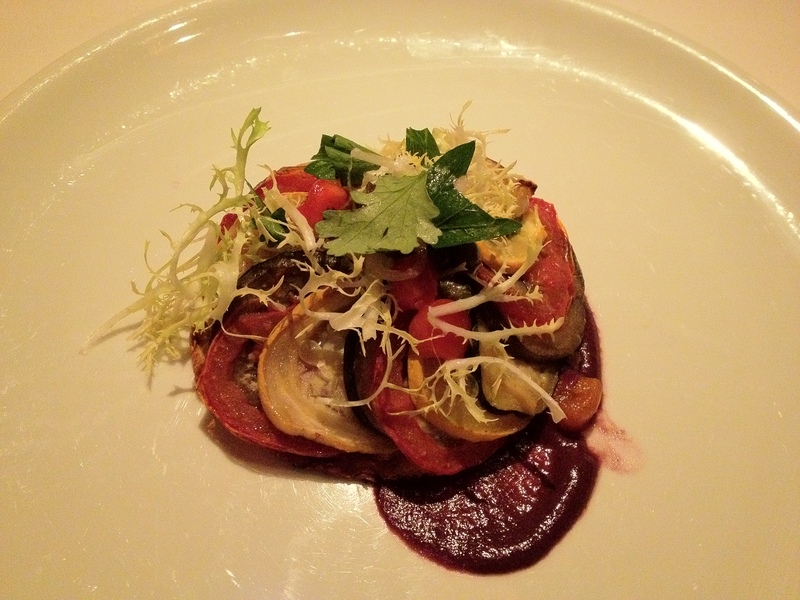 About this dish…meh. 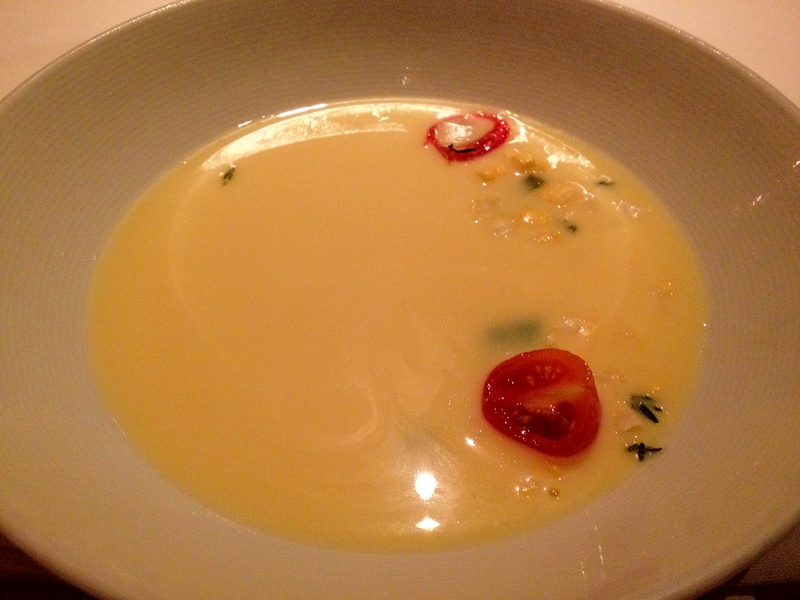 Monte: Corn chowder is love. 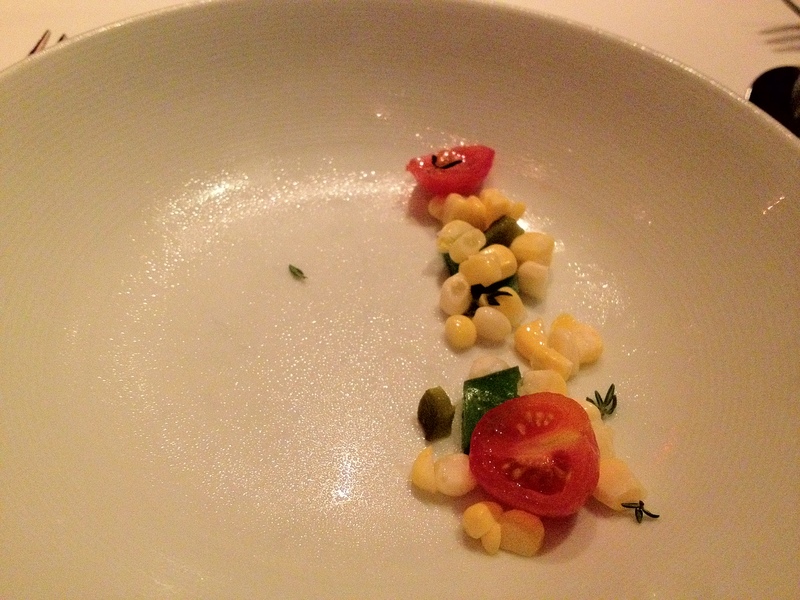 Subtle sweetness of the corn and fresh tomato made this a very light dish! Other corn chowders can be so heavy with cream but Dovetail’s pretty much made the soup as much of a light liquid corn as possible. Also, at this point, we might have started having a deep conversation about how old we would do. Monte: Leeks can have a really strong oniony-licorice flavor that can be unpleasant but for me, this dish had none of that. I never thought of leeks as meaty but this one had a lot of tender flesh that became a beautiful vehicle for the rest of the dish’s flavors. 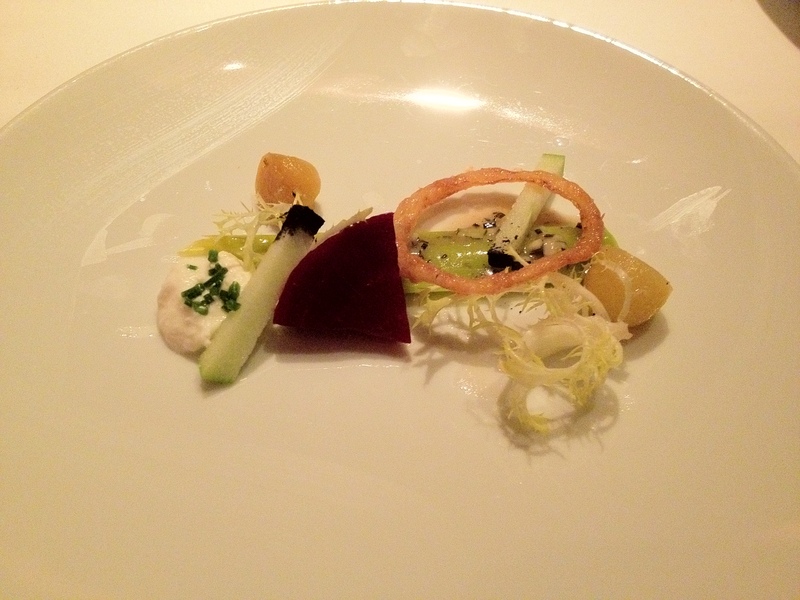 Tad: This is exactly what I am talking about…the simple beet, a root, ugly, humble, and any farmer can eat it. Normal people eat it in salads, praise it for its great health benefits. But in the hands of a skillful chef, its pungent flavor can really tie a dish together. Steven: Like that time you took me to Eleven Madison Park… Ever since that time, I’ve been addicted to beets to try to recapture that flavor. Tad: Well, when I want to do that, I just go back to EMP. 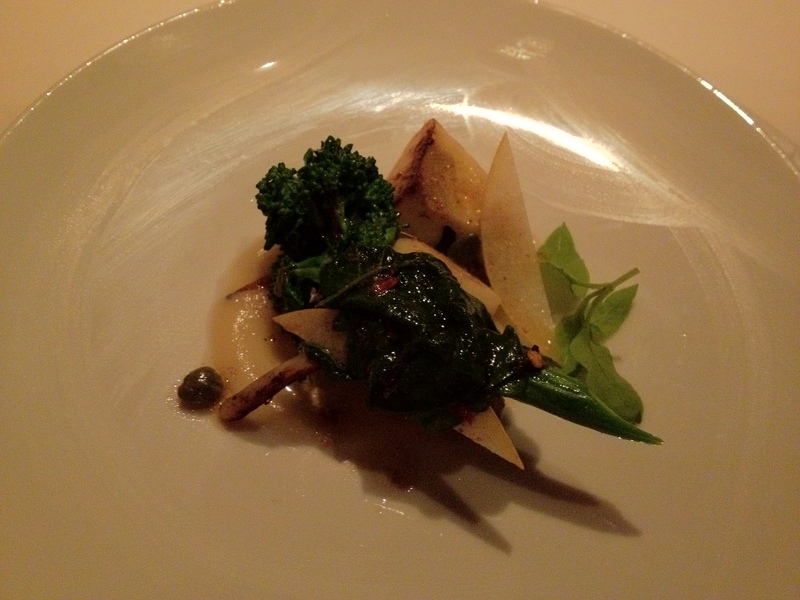 Monte: The capers were very sour and the pear very sweet – together, a good complement but separately not as pleasant. The capers made one’s face purse together to form fish lips. Tad: Hey, don’t you guys just call it pear? Tad: No, because your palates aren’t refined enough to tell the difference. Victor: This is maybe my second-favorite vegetable course of all time, second only to Per Se’s “Red-wine-braised heirloom onions” course. Tad: How do you remember the names of these dishes? I’ve eaten at these places so many times that I really can’t be bothered to keep these dish titles straight. Steven: Yeah, this reminds me of the dish in the Pixar movie. It really is really complex. My favorite dish of the night. Tad: Well, I was speaking with one of my buddies (he produces movies), and he said that Thomas Keller not only served as a consultant on the film, but also had a cameo as the voice of one of the patrons. Ferran Adria was the same voice in the Spanish version of the film. Monte: Oh I’d love to be in a movie, can your buddy get me a cameo role? Victor: This was also excellent, though I see it more as a fake-vegetable dish. I mean… it has eggs—that totally makes it not a true vegetarian dish in my eyes. Monte: The sweet potatoes looked like bacon and goshdarnit tasted even better than any bacon I’ve had. Blasphemous? Maybe. But I stand by it – the sweet potato had a crispy edge reminiscent from many a deep fried dish – but inside, the flesh was sweet and soft, like any baked sweet potato. A must-try dish for sure. Moving on to desserts now! 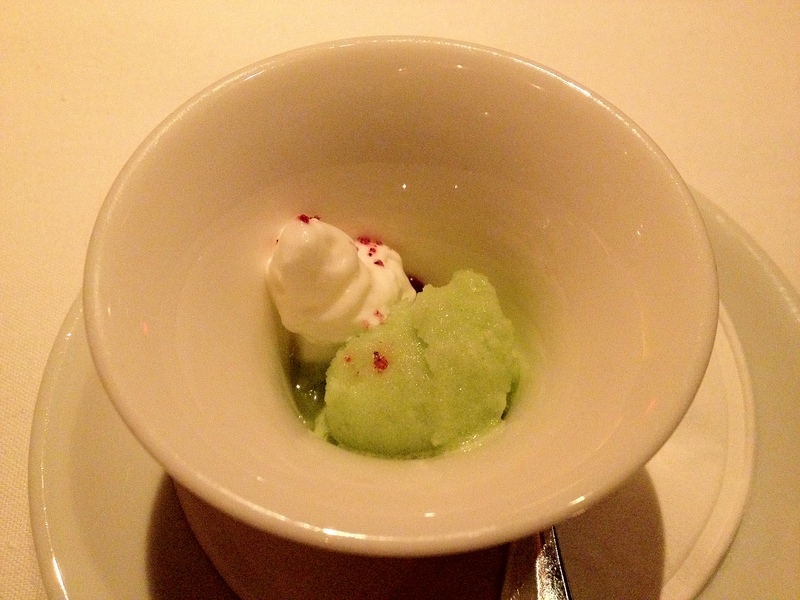 Cucumber-and-lime sorbet with yogurt foam. 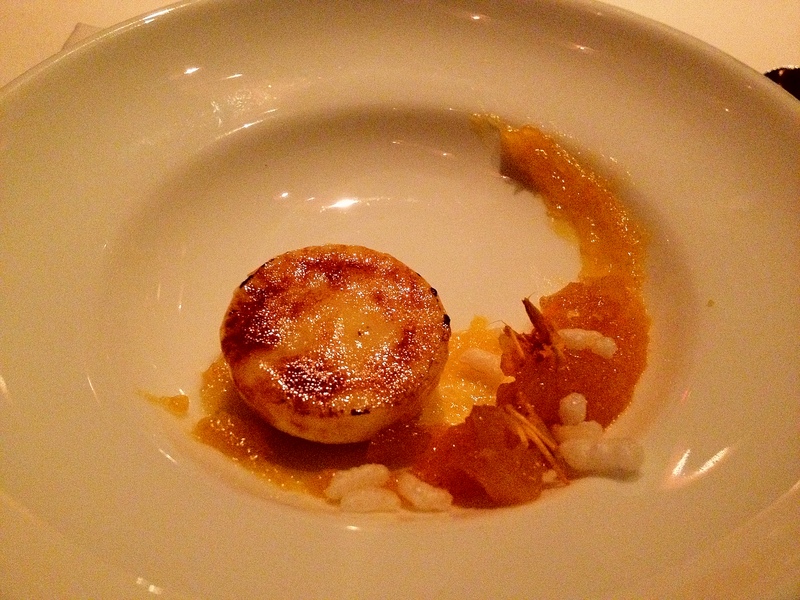 Roasted-rice crème brûlée with apricot purée. Monte: Think about what creme brulee tastes like. Then think about what toasted rice crispies tastes like. Now combine them. This dish of rice creme brulee is exactly as how you’d imagine. It worked really well, with the crispy sweet top and the delicate rice underneath. 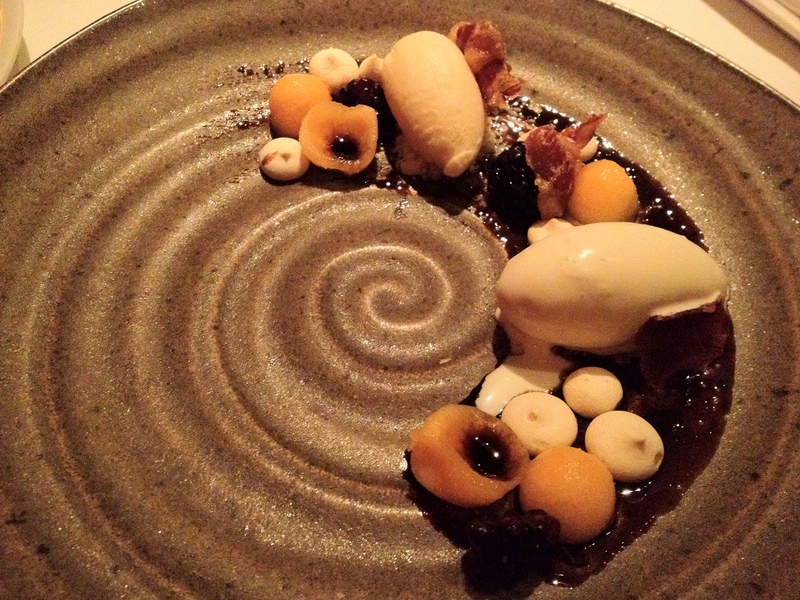 Apricot is really tart and prevented this dish from being overly sweet. 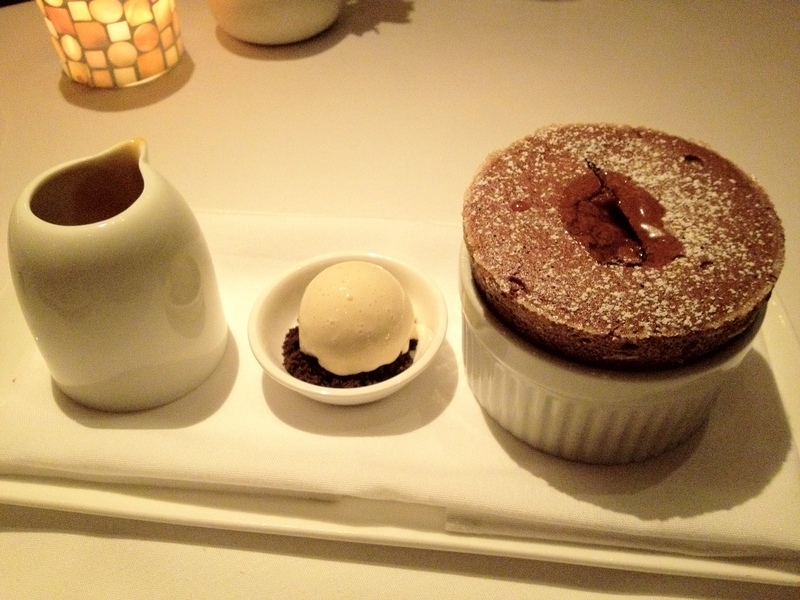 Monte: I’ve seen the first two seasons of Masterchef and both seasons featured a challenge where the chefs have to make souffle, with Ramsey and Graham Elliot both exclaiming that “It’s a dish that scares even the most talented professional chef.” Not Chef Fraser, though; this souffle was rich, soft on the inside, and airy on the out. Like a warm chocolate pillow I want to sleep on. Tad: Very rich. Very intense. Very complex. Just like me. Steven: I got what Tad got because he seems to know what he is doing. Victor: I forgot to take a picture :(. However, I remember them! -Pâte de Fruits with a touch of vanilla and cocoa nib.